Butisattva: BUTI-SATTVA. One that has successfully realized the power to heal is within. Dance has always been a love of hers and good medicine for her. When she was introduced to West African Dance she found something she didn’t know she was looking for, and it felt like a piece of her soul was recovered. The drumming, the movement, the freedom of the hips, the joy, it all spoke to her heart. She has enjoyed performing in multiple dance ensembles on many stages such as Sierra Nevada World Music Festival, Kinetic Carnival, Goddess Craft Faire, Space Theater, and Burning Man. Her African dance history and heritage is why she calls her Buti Yoga offering, Afro Buti. After the birth of her two children Jaynene became engaged in classes where she used her body in indigenous ways of movement. The strength that is gained from lifting ones own body weight, as well as the balance, coordination, and flexibility that comes with it was of such benefit that she incorporated it into her practice. Hence, Primal Rhythm. 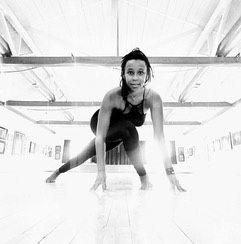 Primal Rhythm seamlessly weaves these life-changing discoveries; yoga, African dance, primal movement and plyometrics. There is a depth to this practice, and she is still learning so much more about each. Originally on this path as an instructor Jaynene knew that there was power locked in our hips. Observation gave her that wisdom as with the obsession with dance moves such as: twerking, dance hall whining, belly dance, West African dance and so much more. Buti Yoga Certification taught her to understand even more how to connect with the inner power we have in all of us and how to harness it. By using the principles of deep abdominal toning and strengthening the pelvic floor through spiraling technique, hip opening, and meditation we awaken the Kundalini energy, that may lay dormant at the base of our spine. Drawing our natural unlimited energy up through each chakra, which is invigorating and empowering allowing us to connect to our abundant creativity, personal power, and for some enlightenment. Jaynene is so thankful and grateful to be on this journey, and invites you to join her on this transformative path of opening, strengthening, and self discovery.